I recently received a series of texts from a former colleague, and the story contained within was all too familiar and heartbreaking. This owner had paid a ton of money to a breeder for two German shepherd puppies only to discover in a short period that the family, which included two very young children, just didn’t have the time to devote to a pair of busy, bouncy and increasingly larger young dogs that needed training, focus and attention. That needed to be shown their place in the world and in the home. Now this owner was looking for a way out, someone to take the pups. The bonded pair is 6 months old. And the breeder will not take them back. Preaching to the choir might seem like an exercise in futility, but it is one way to vent utter frustration, knowing that there’s an audience out there who understands and shakes their heads all the while learning of yet another same old very sad story. Of course there are many other scenarios in which shepherds are relinquished, some avoidable and others not, but in this day and age, where pet owners are glad to spend more than $60 billion on their pets (and claim to be willing to forego a meal of their own in order to feed their pet if necessary), and detailed and accessible breed education abounds, it’s a tragedy that the story never seems to change much. So what does change the narrative to result in happier endings? As much as I would have loved to take in these babies, our household already has two kids, two shepherds, two aging parents and one spouse. So the next best thing was to direct this person to the German shepherd rescue network in Southern California, specifically German Shepherd Rescue of Orange County. I knew they would be in expert, caring hands and would be appreciated and removed from harm’s way until they found a true forever home. As lovers of the breed who understand just how special and yet complicated shepherds are, as volunteers who tirelessly prepare and represent at adoption events, as foster parents who take in the most medically needy or emotionally sensitive dogs, as trainers and day care providers, what more can you possibly do beyond what you already manage? Keep tirelessly asking the important questions of whether thorough breed research has been done and whether a prospective owner/adopter is ready for the commitment that is a GSD? Keep educating the public, through websites and social media, show and adoption events, and volunteer word-of-mouth about the breed and its intelligence, temperament, strength and all the other qualities? Keep fundraising continually in order to keep the enormous machine going? It’s heartrending that yet another sad story is laid at your feet, but sometimes you just have to preach to the choir and know they’re listening and are commiserating with the feelings of anger, resentment, frustration and yes, sometimes, a sense of hopelessness. 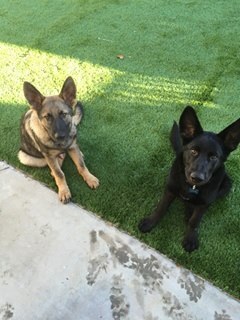 But yet again, the rescue net will catch those 6-month-old puppies that deserve all the love and time in the world, and it’s through the work of organizations such as German Shepherd Rescue of Orange County and Westside German Shepherd Rescue (and countless others) that the sense of despair lifts. At least the stories of rescued shepherds will end happier, and that’s what all volunteers are in it for.